ContentACCESS was developed to solve file and email management, and archiving scenarios in each organization. It allows to manage data from Microsoft Exchange or Office 365 in a secure way, relieve the exchange server from significant amounts of useless data, retrieve them easily in case of need, manage permissions to them and reduce the costs of their storing. 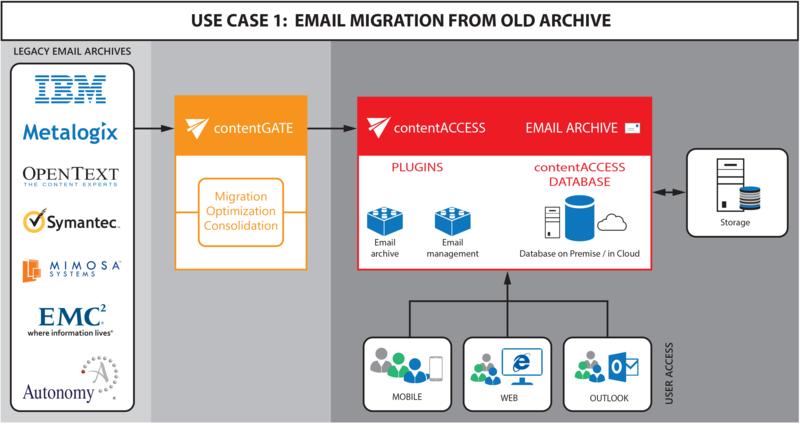 ContentACCESS can process the data kept in a wide variety of DMS (data management) systems, and connect to different storages either on-premise or in the cloud to keep them safe during the required retention time. The archiving process is solved with configurable automated jobs to minimalize human intervention and spare your valuable time. Retention times can be adjusted easily through the software’s central administration user interface. The user may replace archived emails with shortcuts, which can be manipulated just as standard mailbox items. No need to install anything on the client side. Shortcut creation is an effective way to keep the Microsoft Exchange information stored at a reasonable size. Archived emails can be viewed, downloaded, and restored using the contentACCESS archive’s web interface. To ensure light-speed access directly from the mailbox, contentACCESS uses mail applications (Mail app and OWA integration). These enable the user to open the desired documents in just a few seconds, without the need for support by IT-staff. Helps to apply required retention policies. Helps to manage the exponential growth of content. Improves performance and scalability of the company’s IT-Systems. Unburdens the storage from numerous old versions of files. Enables the restoration of archived items manually. Helps to reduce data footprint with a centralized, integrated data archiving solution.